Asos White Label Size 8 Navy Jersey Midi Dress/Top - Low Back Cutout Detail. Condition is Used. Dispatched with Royal Mail 2nd class signed for. Worn once. From a clean, smoke and pet free home. Womens Asos Petite Cotton Mini Shirt Dress 10. Condition is Used. Dispatched with Royal Mail Signed For® 2nd Class. Asos Linen White Cigarette Trousers 8. Worn once. From a pet free and smoke free home. Asos Cold Shoulder Striped Dress. New size 14 Dispatched with Royal Mail 1st Class. ASOS UK size 8 EUR size 36 Cream White Ivory Black Victorian Print Pattern Design Sleeveless Cotton Shirt Dress Button up With collar Approximate measurements: Armpit to Armpit laid flat: 17 inches Armpit to Hem: 25 inches Condition is Used. Dispatched with Royal Mail 2nd class signed for. ASOS White Cotton Top With Print UK 8. Worn just once, excellent condition. Dispatched with Royal Mail 2nd Class. Asos Ladies White Sweatshirt. Cute Penguin Graphic. Long Sleeve Crew Neck. 'Influence' Square Neck Broderie Top. Bought from ASOS. ASOS White Cotton Broderie Short Sleeve Dress 12 . Condition is Used. Dispatched with Royal Mail 2nd Class. BNWT ASOS white cotton oversize smock summer dress 10 Beautiful dress, perfect for summer hols. Brand new with tags. Check out my other big name items, I’ll combine p&p costs for multiple purchases. ASOS Design Curve Mono Animal Leopard Print Smock Top Size 18 Ladies Fashion. White background with black animal print. Loose fitting, comfortable and flattering. Peplum style elasticated detail at bottom. Black piping around neck. Condition is Used but good as only worn a handful of times. Dispatched with Royal Mail 2nd Class. Please feel free to contact me with any questions. Lovely ASOS Floral Print Wiggle Dress. Colour: White with mid blue floral pattern. This dress gives an amazing silhouette. Very flattering on. Colour more in keeping with model shots. Midi length. White Linen ASOS Mini Skirt. Perfect for summer. Size 10. Smoke free home. Condition is Used. Dispatched with Royal Mail 1st Class. Combined postage can be arranged. Please view my other items. Off shoulder raw edge neckline, long sleeve top. Raw edge hemline. Approx length 22". Bust Approx 26". 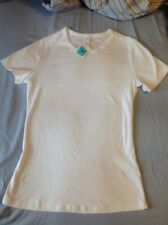 Asos White Linen Boxy Tie Waist Top NWT size 10. Condition is New with tags. Lovely white top, floaty for summer. ASOS CURVE LADIES BLACK / WHITE STRIPE LONG SLEEVE T-SHIRT. HAS RED / WHITE STRIPE POCKET. OVERALL LENGTH APPROX 26". Summer dress size 12 pre owned. Dispatched with Royal Mail 1st Class. ASOS White Label Tunic Shirt Dress. Perfect condition. Sample label attached. Approx length 15" waist to hem. ASOS DESIGN Sleeveless Utility Mini Dress 8. Trendy utility design in white. lovely & clean looking, my pics don’t do it justice! 27% Polyester. Armpit to Armpit 45cm. New Asos white denim wide flared leg retro 70's style jeans. Fun and cool ASOS ‘Juicy’ graphic style White T-Shirt UK 10 . Goes great with a pair of a jeans and some converse, shorts in summer or even chilling and lounging around at home. Size : UK 10 Material : 100% Cotton Made in Turkey New without tags. Gorgeous colours. Feel free to message if any questions or queries. Happy shopping. Dispatched with Royal Mail 1st Class. ASOS White Frill Denim Vest, Size 10. Never Worn, But Tags Removed, Perfect Condition. Smoke & Pet Free Home. ASOS Zebra Print Bye Slogan Tee / Size 8 / Worn Once / 100% Cotton. Condition is Used. Dispatched with Royal Mail 1st Class. ASOS dress worn once Size 8 Perfect spring / summer dress And great as a holiday day or evening dress! Please note this does not have the waist tie. But could be added if you made a trip to a local fabric store :-) Please see other items - can combine postage and send up to 2kg in same parcel and postage remains at £3.95 for recorded delivery. Asoa White Dress 16. Condition is New with tags. Dispatched with Royal Mail 2nd Class Large Letter. In good sound condition, hooded onesie, front muff / kangaroo style pocket and has a dual zip close (top & bottom). All in all a perfect addition to your wardrobe. I do have pets but they don’t wear the clothes! Material - Cotton. Gorgeous Asos Ladies Blue And White Tile Print Floaty Summer Shorts Size 8. Can be worn high waisted. Condition is Used but only worn a handful of times so immaculately kept. Selling as no longer fits. Dispatched with Royal Mail Signed For® 2nd Class. Sample label attached. Cotton jersey fabric. Approx waist 16" un-stretched.